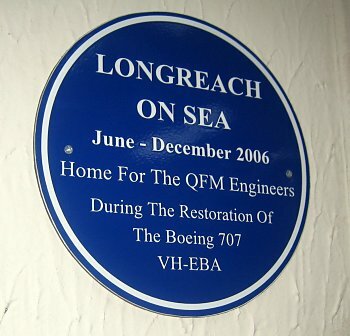 After VH-XBA arrived in Longreach on 10 June 2007, ATC Lasham Base Manager, Ian Dorling, delivered a memorable talk in which he referred to the "QFM Executive Suite of Offices" at Southend. He went on to describe this facility somewhat less pretentiously as "basically a green Portakabin". 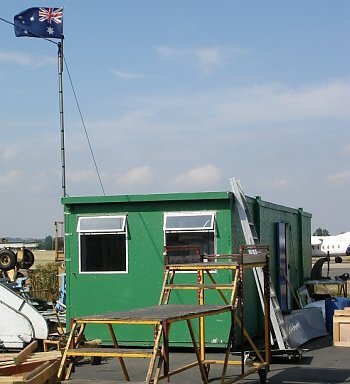 This structure had been positioned on the ramp next to VH-XBA and it was to become the operational base to the QFM engineers during the six months they were in Southend-on-Sea presiding over the rebirth of the first Qantas 707. Such was the bond that formed between the staff of ATC Lasham and the QFM engineers that Ian could not bring himself to dispose of the green monstrosity after VH-XBA and the QFM engineers had departed from Southend. Accordingly, the green Portakabin was pressed into service inside the ATC Lasham hangar. 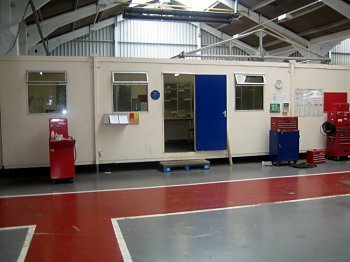 QFM's Norman King describes its function as "a crew room for the use of our fellow engineers". In one major concession to good taste, the building has been rendered non-green. In recognition of the building's historic significance, it has been proclaimed Longreach on Sea and a special heritage marker to that effect has been permanently fixed near the doorway. It is hoped that it will serve as a lasting reminder of the very special and enduring bond that exists between QFM and the staff of ATC Lasham. As this page is being written (in September 2008) history is being made in Australia with the swearing-in of the nation's first female Governor-General. A widely popular appointment, Her Excellency Ms Quentin Bryce AC, although born in Brisbane, was raised on the family property at Ilfracombe which is 27km from Longreach. The delightful irony of Longreach on Sea may be lost on some non-Australian readers for whose benefit it is explained that Longreach is approximately 700 kilometres from the nearest sea (as the Boeing 707, or indeed the Avro 504K flys). The "QFM Executive Suite of Offices" at Southend on 17 August 2006. "Longreach on Sea" in the ATC Lasham hangar at Southend Airport. "QFM Executive Suite of Offices"
has not entirely surrendered its green heritage.